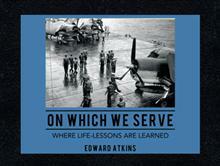 In Edward Atkins’ new book “On Which We Serve: Where Life-lessons Are Learned” (published by WestBow Press) are found 355 National Archive photographs of service aboard a U.S. Navy aircraft carrier during World War II. The book recounts the activities of a sailor fresh out of high school as he “works” the flight deck of a fleet aircraft carrier and, in so doing, evolves life-lessons learned based on First Principles such as responsibility, accountability, respect for others, empathy and trust and the life values and virtues. “The book ‘On Which We Serve’ is actually two books under one cover presented simultaneously. The "first book" (which is one of a kind for ALL time because it’s in the first-person) deals with the activities taking place on the flight deck of a fleet WWII aircraft carrier, along with a somewhat brief telling of the history of the naval progress as it fought its way westward across the Central Pacific to the shores of Japan. This is illustrated by 355 superb full-size National Archives photographs. Edward Atkins grew up in Montclair, New Jersey where he attained the Eagle Scout Badge with Bronze Palm at 14. He played on the Newark Academy varsity football and basketball teams before serving in the U.S. Navy during WWII, then graduated from Yale University with a B.S. in Business Administration. Next he worked in New York City banks and electronic companies. After seven years, he earned a B.S. Electrical Engineering degree. Next he worked for a company managing the Polaris Missile System for the U.S. Navy. This led to working for the U.S. Navy Electronic Systems Command in Washington, D.C. as a management engineer until retirement in 1991. His outside interests centered on the field of robotic devices and the use of computers to develop neural network applications (in medicine, maintenance, decision-making, and other if-then problems). Later he compiled a trilogy consisting of this volume and two additional volumes. For more information, visit Atkins’ website at http://www.on-which-we-serve.com.